The top level of Angkor Wat, the Bakan, reopened in the middle of January. Last week was my first opportunity to go to the top since it closed back in October 2007. Regulations have been introduced to restrict numbers of tourists, as well as time limits and rules on dress, etc, so a visit is not like it was 'back in the day'. Nevertheless, it was pleasing to be able to look out once again across the treeline that surrounds the temple and then into the heat-haze on the western side, as you look back towards the entrance and the moat. I was looking through some photos from my visit with the Heritage Mission last year to look around some of the colonial French buildings still standing in Phnom Penh when I realised that I hadn't posted a few pictures of the old Hotel Manolis that stands opposite the Post Office and is now home to many families, who've converted the old hotel suites into homes. The Manolis Hotel was constructed in 1910 and looks out onto the Post Office square. Fifty years ago there were no fancy restaurants or families out on strolls around the riverside, it was a rough and ready port area, and the chandlers, shipping companies and other businesses catered to the merchants and crews that arrived there. Some of the oldest surviving businesses along the quay are the two coffin shops along the north stretch. They always seemed odd with all the other shops selling shoes and CDs nearby, but I guess they have been there for far longer, and somehow business is still good. 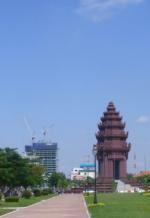 It's one of Phnom Penh's most visible architectural relics: a prime project for preservation and a developer's dream. It's known as simply the "Old French Mansion," and now it has a new owner, and a bright future. After years of interest and negotiations, the FCC Phnom Penh and its parent company Indochina Assets Limited recently obtained the title for the ornate colonial-era villa across from the National Museum at 32 Sothearos Boulevard.